WASHINGTON — President Donald Trump cast the midterm election as a “big victory” Wednesday, relishing Republican wins in the Senate even as he suffered a major political setback in the House, where he will face an emboldened Democratic majority for the first time in his presidency. In a combative news conference at the White House, Trump urged Democrats to work with him on bipartisan legislation while threatening a “warlike posture” if they use oversight authority to subpoena his tax returns or cellphone records or to investigate a host of other sensitive matters. “Now is the time for members of both parties to join together, put partisanship aside and keep the economic miracle going strong,” Trump said, referencing infrastructure, trade and environmental policy as ripe for bipartisan agreement. 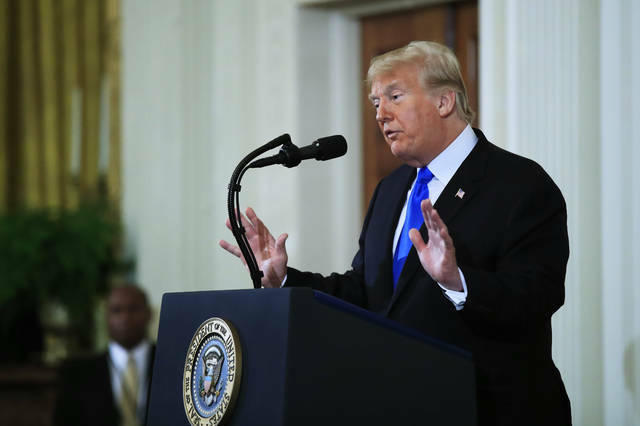 Trump touted his party’s Senate gains and taunted Republican moderates who lost their seats, claiming that their decisions to distance themselves from him backfired in suburban districts. In reality, the president’s unpopularity in some areas proved too toxic for several candidates with strong individual brands to overcome. The president refused to reckon with questions about his own inflammatory rhetoric throughout the race, continuing to blame the media for creating a divisive political climate in a campaign that will be remembered, in part, for a Florida man who mailed pipe bombs to the president’s opponents, and a gunman who killed 11 worshippers in a Pittsburgh synagogue. When asked if his declaration of himself as a “nationalist” in the final weeks of the campaign could have sent a signal of tacit support to white nationalists, Trump lashed out at the reporter asking it, an African-American woman. The president sent mixed signals about whether he should have softened his rhetorical tone, telling reporters that he couldn’t do so before the midterm election while blaming the media for his divisive, grievance-stoking closing message. In a letter delivered to the White House later Wednesday, Sessions wrote that he was submitting his resignation at the request of Trump. At the news conference, Trump said he’d decide on the fate of Interior Secretary Ryan Zinke in a week. Zinke has faced multiple ethics investigations, and at least one case has been referred to the Justice Department for possible prosecution. Speaking to reporters earlier on Capitol Hill, Senate Majority Leader Mitch McConnell, R-Ky., offered a glimpse of how Republicans will seek to preempt investigations by the new House majority, framing them as “harassment” and warning Democrats of overreach as the 2020 presidential cycle starts up, citing Republican attempts to impeach President Bill Clinton in 1998. While Trump expressed optimism about bipartisan compromise, McConnell was more realistic, acknowledging that split control of Congress makes major legislative progress less likely. Congressional leaders from both parties say they want to pursue an infrastructure bill and health care legislation, but have provided few details on what they plan to do. McConnell said his top priority will continue to be filling the judiciary with conservative appointees and that the GOP’s slightly larger Senate majority, coupled with the likelihood of a minimal legislative workload, will only make that easier. “I think we’ll probably have more time for nominations in the next Congress … because the areas of legislative agreement will be more limited,” he said. Trump told reporters that his tweets congratulating Rep. Nancy Pelosi, the Democratic leader from California who is hoping to become House speaker again under her party’s new majority, were “not sarcastic” and that, despite his constant attacks on her that were a feature of his campaign rallies, he has real respect for her. Pelosi, who held her own news conference on Capitol Hill shortly after Trump’s ended, celebrated Democratic gains and vowed to focus on “strengthening the institution” of Congress as a check on the executive branch. Trump continued downplaying House losses so far. He spent most of his time and energy in recent weeks in boosting Senate and gubernatorial candidates — holding rallies in pivotal states — an area where Republicans did relatively well. Trump also tweeted congratulations to Ron DeSantis, a close ally who won the Florida governor’s race, a boost for Trump in the 2020 presidential election in a state he visited several times in recent weeks. But his effort Wednesday to command the post-election narrative also exposed existing fissures in the GOP coalition. Rep. Ryan Costello, a Pennsylvania Republican who opted not to run for re-election and saw Democrats flip his seat Tuesday night, blasted Trump for name-checking fellow moderates like Reps. Mike Coffman, R-Colo., Carlos Curbelo, R-Fla., and Mia Love, R-Utah, who lost. “To deal w harassment & filth spewed at GOP MOC’s in tough seats every day for 2 yrs, bc of POTUS; to bite ur lip more times you’d care to; to disagree & separate from POTUS on principle & civility in ur campaign; to lose bc of POTUS & have him piss on u. Angers me to my core,” Costello tweeted. Though Florida was a big prize, Democrats picked up at least seven governorships, including in Wisconsin and Michigan, Midwestern states that were pivotal to Trump’s 2016 election. The House losses, while expected, make the night a net loss for the president, whose party no longer controls both chambers. Some votes have not yet been counted. But Democrats did far better Tuesday than they did in 2016 in total votes in races for the House, besting Republicans by a projected 7 to 8 percentage points. They lost to Republicans by 1 percentage point in 2016. That swing of about 8 points would be one of the largest since the end of World War II, about on par with the swing to the GOP in 2010, according to Matt Grossmann, a political scientist at Michigan State University, who tracked and tweeted about the disparity as the results came in. More than any president in recent memory, Trump made the election about his own tenure in the White House. On Wednesday, he was eager to turn that political reality into leverage with his own party, solidifying his takeover. Trump also foreshadowed an aggressive response to Democratic investigations on Wednesday with a naked vow to use the power of his office to retaliate against Congress, which has a constitutional responsibility to oversee the executive branch.